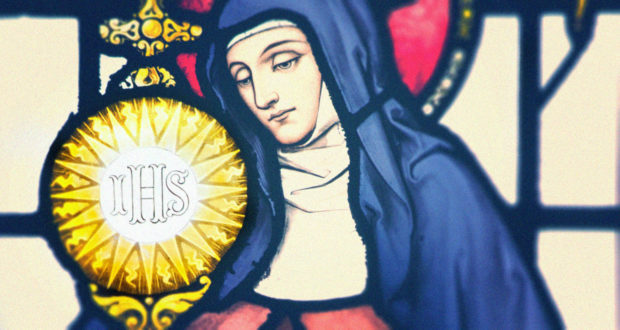 Those in the Franciscan Order, as well as lay people who are in the Franciscan Third Order, will be celebrating the feast of St. Clare of Assisi on August 12. Clare and her two younger sisters were homeschooled by their wealthy parents, all three growing up in a well-to-do manor house. Both the Count and the Countess dedicated themselves to helping the poor. The family was known and respected for their religious practices and their generosity toward others. Clare’s mother was described as a “pious gentlewoman,” who dedicated her life to teaching her daughters to serve God through prayers as well as service. Countess Ortolana emphasized to her three daughters, Clare, Agnes, and Beatrice, to keep pure and to practice a life of dedication to the Blessed Mother. The family respected their neighbor, Francis, who gave up his financial inheritance and depended solely on God. Clare was attracted by his message of repentance, renunciation, and following God’s will. Francis was impressed by Clare’s deep spiritual life. He went to the local bishop to obtain permission to establish an order of nuns who would stay in prayer for the work of Francis and his followers. He told the bishop that young Clare, only 18 years old, should become a nun and lead the new order. On Palm Sunday, in 1212, the bishop handed out the palms in the church, but Clare stayed in her pew in deep meditation. The bishop walked down the aisle to her pew to give her the palms, and his contact with her eyes, and surely the Holy Spirit, convinced him that Clare should be the “mother” of the new order of nuns. Clare then walked alongside the Franciscan brothers to the convent of the Benedictine nuns where she would stay until a convent would be built for new Franciscan sisters. Immediately, Clare’s mother, father, and sisters supported her. Eventually, both her mother and her two sisters joined Clare’s order of nuns. Soon they would become known as the Poor Clares. Over the years, Mother Clare and her nuns practiced great fasts, a serious prayer life, and true poverty. Many miraculous cures were attributed to blessings by Mother Clare. The most well-known story about St. Clare is the event in 1244 when the army of Emperor Frederick II, at war with the pope, sent his army to attack the town of Assisi. Though Clare was sick in bed, she asked the priest to bring her the ciborium which held the Hosts of Jesus Christ. As the soldiers approached the wall surrounding the convent, Clare raised the ciborium and prayed, “I beseech Thee, Good Lord, protect these whom now I am not able to protect!” The soldiers fell back as if struck by lightning and fled from the convent walls. The story of St. Clare is especially inspiring for homeschooling families. The family prayed together, learned together, worshipped together, helped the poor together. Mother and daughters even joined the convent together! In one of his talks before homeschooling parents, Father Joseph Fessio stressed the fact that homeschooling families must be like little monasteries, living the Catholic Faith and preserving the Faith in their homes. Like the monasteries of old, which were like little enclaves of Catholic faithful, homeschooling families today must recognize that the American culture in general is antagonistic to the Christian life. Catholic homeschooling families must strengthen themselves, strengthen each member, for the anti-Christian attacks around us. Catholic homeschooling families must stay in daily prayer, attend Mass every day if at all possible, say the daily rosary, go to Confession frequently, and pray for our country and other countries in such desperate need of the teachings of Jesus. Blessed St. Clare, whose very name means light, illumine the darkness of our minds and hearts, so that we all may see what God wishes us to do, and perform it with a willing and joyful heart. Before your birth, a Heavenly voice foretold that you would be a light illuminating the world. Be a light to us and to our country and to the world, in the sorrows and anxieties of this earthly life, and lead us into the eternal light and joy of our home in heaven. Amen.